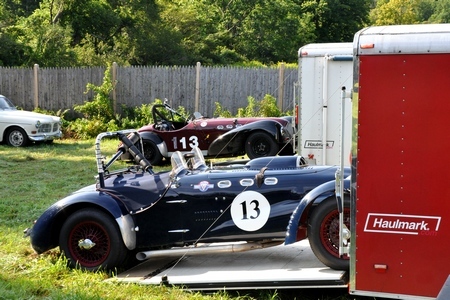 Finishing 2nd and 3rd behind a single-seat Lotus 18 Formula Junior, the Whimsey Racing Team of Allard K2 and J2 proved the fastest two-seat sports cars on the slopes of the fabled Mount Equinox in 2014. Run on the 9th and 10th of the August, the annual jewel in the crown of the VSCCA calendar had 39 entries this year ranging from E-Type Jaguar, Aston Martin and Maserati to MGs of all shapes up through the MGA, a pair of SAAB Quantums (highly strange, even for an Allard guy), God-knows-how-many Lotuses (Lotii?) several prewar specials, and a Hillman Minx of all things. Allards have always done pretty well at Equinox from the earliest days. For a number of years, the event was chaired by Bob Girvin who always managed a spectacular climb in his Chrysler-powered Allard GT. Back in '51 or '52 the large engine class was won by an Allard K2 and lately yrs trly has done pretty well in the K2, and then in the J2. For 2014 the road surface was as bad as anyone had ever seen it. Remember, this is a road in the mountains of Vermont with logging trucks rolling up and down it through the ice and snows of the winter. For those of a certain age, it's not unlike the Ho Chi Minh Trail after the B-52s were done. Over the years I've suffered stress cracks to the body as well as broken gearboxes, engine mounts and such. The road is about 5.3 miles long with over 3000 ft of elevation change. There are eleven or more hairpins and countless turns and curves of lesser radius. It's a tough challenge. Yrs trly took a while to get dialed in this year (he's not getting any younger), but by end of weekend was third behind Mike and a second and a half ahead of the next car, a Lotus VII. The next car was a pretty impressive E-Type. This is being written a couple of days after the event and the two of us are still smiling.